Source: Grown in Mexico and the United States. Handling Tips: 40° F. DO NOT MIST. General Information: This bean is 6-8" long with a soft, green outer shell. The entire bean can be eaten if harvested when the bean is only 2-3" long. Most favas should be shelled prior to eating. Raw or cooked, the fava has a pungent palatableness. Good source of vitamins A and C and also potassium. Quite sophisticated for a bean per se and considered a culinary luxury by its true fans and chefs, five to seven fava beans are encased in a large green pod that is definitely inedible. Even though the pod is smooth skinned and soft, it is tough and must be peeled away and discarded. Nutritional: Low in calories, one cup contains about 80 calories. High in fiber, protein and iron, fava beans are a good source of vitamin A, vitamin C and potassium plus provide modest amounts of the B vitamins. Eating five daily servings of vegetables and fruits lowers the chances of cancer. A recent study found that eating nine or ten daily servings of vegetables and fruits, combined with three servings of low-fat dairy products, werre effective in lowering blood pressure. Ethnic: Loved in China, fava beans appear dried, fresh or fried and salted on the Iberian peninsula. India and the eastern coastal Chinese region near Shanghai cook, skin, and serve fava beans in a brown-sauce dressing or in oil. Chinese cuisine prefers them steamed and served cold as an appetizer in a sesame oil dressing. Parts of Asia love them as a snack by salting, dry-roasting or crisp-frying them. In Sichuan, fava beans are made into a popular pungent seasoning. Applications: The fabulous fava should be savored all by itself or with limited, and only the finest, ingredients. Gently stew in cream, butter, or oil; season with savory, sage or thyme to taste. Pair with mildly smoked meats and sauteed veal. Seafood especially adores this flavorful bean. Pan juices of roasted pork, chicken or veal make a tasty hot bath; spoon juices and beans over meat just before serving. Add this bean's goodness to salads and stir-fries. Use as a flavorful accent for rice or pasta dishes. Puree; add to vegetable dips. To prepare, remove skin from beans. To shell, cut off tips from pods; press open seams. Pull out beans; remove little stems as necessary. Drop beans into boiling salted water; boil only thirty seconds. If cooked longer than one minute, skinned beans may get mushy. Drain; chill in ice water. Slit skin of cooled beans with fingernail or small paring knife; slip out beans carefully to prevent damage. Use as desired. To store, spread beans in a wide dish; keep only a few days as they are perishable. Freeze shelled, blanched or skinned beans. Fava beans may be sprouted; use sprouts as a vegetable. History: A very ancient "bean", this age-old vegetable actually dates back to the European Iron Age. The word "faba" means bean and was named after a noble Roman family, Fabii. An important ingredient in Chinese cuisine for nearly five thousand years, the French love favas so much that fava bean season is celebrated as a very special occasion in southern France. Introduced to America in 1602, American cooks for some reason haven't really bonded to this edible morsel so favas continue to be a specialty item. In the United States, mainly the southern states enjoy its culinary virtues. Old English cookbooks refer to it as "the common bean" and most English-speaking countries call it "broad bean". The fava bean is botanically known as Vicia faba minor, rightfully a vetch, and is not a true bean as beans, such as snap, black, pintos, limas, wax and cranberry, are of the Phasaeolus species. A vetch is any of the twining or climbing plants of the genus Vicia. 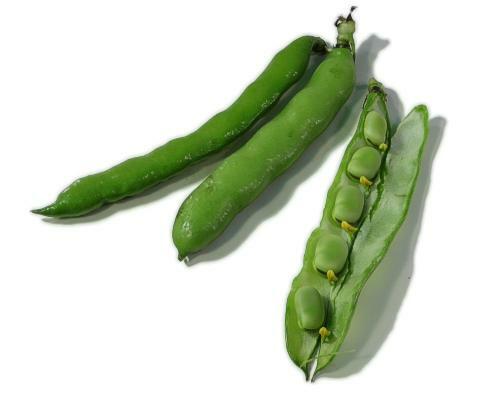 Other names for the fava include English bean, Windsor bean, tick bean, bell bean and horse bean.